Is ‘Africapitalism’ the next big thing in international development? Pronouncements that ‘the age of aid is ending’ as ‘Africapitalism takes root’ suggest it is, as a new generation of African billionaires advocate new models of philanthropic investment. Africapitalism is related to ‘philanthrocapitalism’, a term associated with what Michael Edwards has called a ‘Silicon Valley consensus’ of mainly US-based philanthropists, led by the Bill and Melinda Gates Foundation (BMGF). The central idea of philanthropcapitalism is that the application of business principles can transform the social development sector, ‘extending leverage’ through links with the private sector and achieving ‘impact at scale’. Meanwhile, the recent G8 summit has given its backing to a New Alliance for Food Security and Nutrition, a major new US initiative that aims to ‘help lift 50 million people in sub-Saharan Africa out of poverty in the next 10 years by supporting agricultural development’, in which agri-business corporations are to play a key role. As the Guardian has recently highlighted, ‘the involvement of wealthy investors in the development debate has increasingly blurred the lines between private investment and philanthropy.’ This article takes a closer look at two examples of philanthrocapitalism-in-action to show how the goals of making and giving money become blurred in practice, in ways that are not immediately obvious. In the early 1990s, scientists at the Swiss Federal Institute of Technology secured funding from the International Program on Rice Biotechnology, a programme set up by the Rockefeller Foundation to develop biotechnology research capacity in science institutions in the North and South. The aim of their project was to genetically engineer rice with pro-vitamin A content. In 2001 a lead article in Time magazine announced the project results with the headline: ‘this rice could save a million kids a year’ effectively ensuring the status of Golden Rice as ‘poster child’ in an increasingly polarised GM crop debate, whilst overblown claims made for a technology still in the lab attracted contestation and controversy. 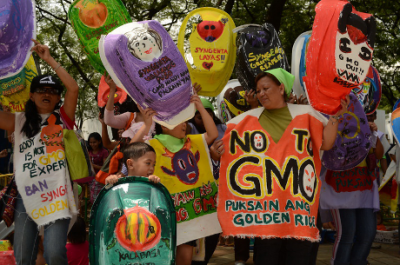 Mothers protest GMO Rice on World Environment Day. Demotix/Mark Demayo. All rights reserved. Nevertheless, a consistent theme running through Golden Rice project communications over the years has been an emphasis on the institutional constraints and achievements, which has diverted attention from the faltering progress of the research itself. The celebration of the project as a ‘new type of public-private partnership’, as the only way forward in negotiating the ‘maze’ of patents, is a case in point. In the early 2000s, the Bill and Melinda Gates Foundation began funding a new research project called ‘Water Efficient Maize for Africa’ (WEMA). In the context of concerns about the impact of climate change on African agriculture, the project aims to develop and disseminate varieties of drought tolerant maize to smallholder farmers. In its institutional structure WEMA shares certain key features with the Golden Rice project. Patented, genetically modified materials (in this case, containing the ‘drought tolerance’ trait) have been ‘donated’ by the Monsanto company for back-crossing into locally grown varieties of maize, via a technology broker and public-private partnership called the African Agricultural Technology Foundation (AATF). As was the case with Golden Rice, alternatives to this particular mode of technology transfer – which might have included the generation of starting materials locally, and therefore free of patent restrictions (as well as potentially more suited to local environments) – were not explored. WEMA differs from the Golden Rice project in an important respect, however. While Golden Rice varieties will be open-pollinated (thus enabling farmers to save seed from one season to the next) the WEMA maize varieties will be hybrids, which means that farmers will need to purchase new seed each year. Given that the project targets smallholder farmers in drought-prone areas, known to habitually save and exchange seed, this would mean a significant additional cost for these farmers, should they decide to adopt the technology. Thus far WEMA and the AATF has avoided the controversy courted by the Golden Rice project. The organisational image could not be more different: AATF presents itself as an African institution. Criticisms of the role of corporate interests and control, so heightened in Golden Rice debates, have been muted, while WEMA managers have more been cautious in their estimates of when technologies can be expected to emerge from the pipeline. Nevertheless, the ‘virtual identity’ of drought tolerant maize as a symbol of technological promise has made itself felt in debates surrounding the design of biosafety regulatory systems currently under development in Sub-Saharan Africa. The use of WEMA project communications to advocate ‘science-based’ – that is to say, more permissive – regulation suggests this is a role that has passed seamlessly from Golden Rice to WEMA. As concerns about effects of climate change on African agriculture continue to grow, the promise of drought tolerant maize may yet prove to be a powerful lever in shaping regulatory frameworks in the region. Meanwhile, projects like WEMA provide an opportunity for continued experimentation and learning, by various actors, including the life sciences industry, in the conditional transfer of intellectual property rights and benefits. ‘Win-win solutions’ - or winners and losers? Debates about private philanthropy often separate the giving of money from the making of it. Drawing upon two examples of philanthropy in action, this article has shown that the dividing line is not so easily drawn and often obfuscates important issues. However, the ways in which capital accumulation and philanthropy are interwoven is not always obvious. Private philanthropists enjoy an independence from short-term incentives and pressures, highlighted by critics as a lack of accountability, which enables them to take a long-term view and experiment. The decision, by the Rockefeller Foundation, in the 1980s, to invest in a 15-year International Program in Rice Biotechnology, is a clear example of this. Similarly, the BMGF has taken decisions to support, not only the development of new technologies, but also new types of public-private partnership. These partnerships can be seen as institutional experiments that are already shifting debates about GM crops and their regulation: reframing questions of ‘access’ to technology in terms that valorise the technology ‘donor’; and advocating regulatory systems that ‘enable’ more rapid approval of new technologies. Meanwhile the single-minded pursuit of technological and institutional solutions that connect to the market, both ‘upstream’ in top-down modes of technology transfer, and ‘downstream’ in privatised seed delivery channels, detracts from alternative approaches that respond to local realities and build sustainable solutions on local innovations and capacities as demonstrated, for example, by the organisation Practical Action. The Asian Green Revolution, launched with the support of the Rockefeller and Ford Foundations in the 1960s, was a public sector effort which nevertheless played a key role in opening up developing country agriculture to capitalist investment, for good or ill. Today, it is important to look beyond the ‘win-win’ rhetoric and critically examine contemporary philanthrocapitalism in practice, and ask who will be the likely winners and losers in the long term.